During browsing Chinese shops on Ebay, I've found item listed as USB 3.0 2.0 to SATA/IDE 2.5"/3.5" HDD SATA IDE Adapter Converter Cable 5Gbps for $14.98. I have bought this one, because of the price and hoped that it will work in Linux. After several weeks device arrived and there is a brief review. Fig. 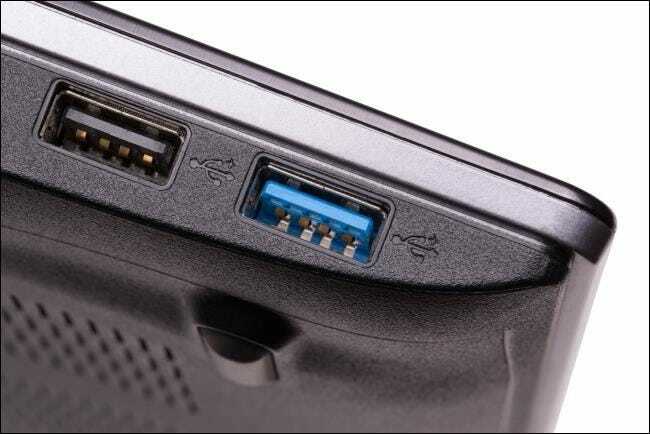 : If you wondering if your setup has USB 3.0, it is pretty simple, the USB 3.0 connector has a blue tongue. The USB↔SATA/IDE device is identified with Vendor ID 0x1f75 and Product ID 0x0611. The vendor is Innostor Technology Corporation and device is based on IS611 USB3.0 to SATA/PATA Bridge Controller. The device starts to work automatically right after connecting to my linux box with kernel 4.5.7-200.fc23.x86_64 in Fedora 23. The package contains cables for SATA and SATA power, also molex connector for IDE disk power, power supply supports 100-230 V mains. Note: Buying cheap noname hardware is always risk, because you do not know what are you exactly buying. Even devices looking same and sold as same brand could often contain different chips from different vendors and not all of them are supported in your OS. It is pity that sellers cannot describe proper HW identifications. But good think is, when they are offering any drivers to download. It is usually Windows driver (when provided as self-extract Setup.exe, it can be unpacked by cabextract) and then there will be some human readable file *.inf with device identification, for example USB\VID_1F75&PID_0611 (then you can search for this USB Vendor ID and Product ID and find if the device is supported in Linux). The direct connection (buffered disk reads) is faster (almost 27 %), but number for cached reads is very low. From hdparm's manpage: This measurement is essentially an indication of the throughput of the processor, cache, and memory of the system under test.. The slower system has DDR2 800MHz memory and Intel i2 CPU, the faster one is DDR3 1600MHz memory and Intel i7. So this explains that big difference. I'm using this interface for few days now, with ext4 filesystem and I did not find any problems. Because this price and USB 3.0 support it is a great deal.